Bette Davis and Joan Crawford. Two legendary actresses from the Golden Era of cinema, and quite possibly the fiercest rivals ever to star in a motion picture together. Actually, to call them rivals would be an understatement. These two ladies hated each other, so naturally they were the perfect pairing for a film where jealousy and hatred were the catalyst for tragedy. Jane Hudson (Bette Davis) is an aging child star left to care for her wheelchair-bound sister Blanche (Joan Crawford), also a former child actress. Stuck living together in a mansion in old Hollywood, Blanche plots to get even with Jane for the car crash that left her crippled years earlier. But Jane is desperate to keep Blanche imprisoned as she plans a new rise to fame, and tries to hide Blanche's existence from doctors, visitors and neighbors while she devises a way to get rid of her sister. Bette Davis plays “Baby” Jane Hudson who was a spoiled child star in the early 1900s. Her sister Blanche Hudson (played by Joan Crawford) was jealous of her, and upset at how she was basically ignored by their father (who was too busy basking in his daughter’s success). Fast forward to 1935, and the roles have been reversed. Both ladies had gone on to be actresses. However, while Blanche’s films were seen as successes, Jane’s were seen as utter failures. On their way home one night, one of the sisters gets out of the car to open the gate leading to their driveway. The other hits the gas pedal and drives into the gate where the other is standing. Fast forward to 1962 where Blanche is paralyzed from the waist down, and is being cared for by Jane who initially felt some guilt over causing what happened to her sister in 1935. But as time went on, Jane’s jealousy and anger towards her sister increased to the point where it became uncontrollable. 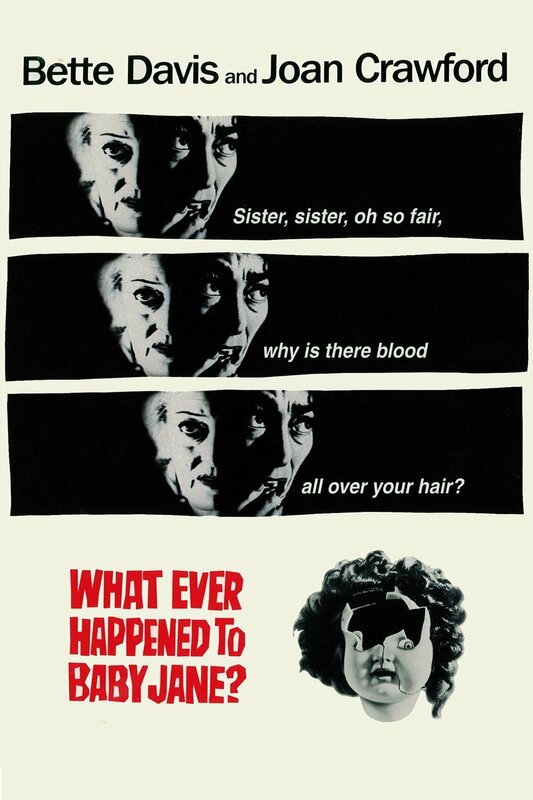 She could no longer deal with everyone remembering Blanche as a legendary actress while forgetting that Baby Jane even existed. What happens next is a whirlwind tale of madness and torture culminating in one of the most emotionally charged, gripping, and well acted horror films I’ve ever seen. This movie was 2 hours and 14 minutes, yet the time seemed to fly by. Most of that has to do with how much the film absorbs you into the current life of Blanche and Jane. You meet their neighbors, get an idea of their routines, and how the sisters initially feel comfortable in their daily roles. But Jane’s deliberately paced descent into madness, is a spectacle to behold. More and more she ramps up the atrocities committed against her sister. From disconnecting the phone in Blanche’s room (the only other one in the house is downstairs), to serving Blanche her roasted pet bird on a platter, then a dead rat, leaving Blanche to starve as well as having no access to water, ultimately tying her arms up, taping her mouth shut, and locking her away. Bette Davis was nominated for an Oscar, and she deserved every bit of it. Joan Crawford was just as great. Even if I didn’t previously know about their infamous real-life hatred for one another, I wouldn’t have been surprised after watching this. There was real tension between the two actresses that felt natural and unforgiving. That tension proceeded to permeate throughout the film’s tone. And just as we get to the boiling point, we’re told something that completely changes the dynamic of the film at the very end. It was such an oddly fitting twist that shows just how screwed up these two ultimately became by their hatred and jealousy of one another. After this movie, and leading up to the passing of Joan Crawford, both women discovered they had a mutual respect for one another. It’s a rare film where real-life feelings can be expertly honed into giving the audience something memorable and a timeless classic. I really enjoyed this more than I thought, and it deserves every bit of praise that has come it's way.